3 great reasons to love SALE-A-BRATION! 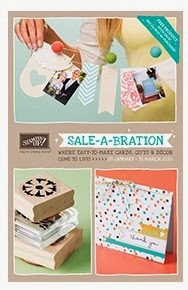 Receive a FREE SALE-A-BRATION product for EVERY $90 that you spend on any Stampin' Up! product! Check out the free products that you can earn in the catalogue (p 10-17). Host a Stampin' Up! workshop (or catalogue party) over $500 and you'll receive an EXTRA $50 in hostess benefits! Book your workshop with me today for a fun time with your friends! Everyone gets to create a card or scrapbook layout to take home and you get to earn free products! Join Stampin' Up! during SALE-A-BRATION and you'll get to choose $255 worth of Stampin' Up! products in your starter kit for just $169. Join now online here or contact me with any questions. Please contact me with any questions you may have. You can email me your order at any time or order online here. Remember also, that the extra hostess benefits applies to any order placed, not just workshop orders, so if you want to put a couple of your friends orders together, or if you have a BIG wish list, you'll get all the free SALE-A-BRATION products and hostess benefits on your order! If you would like your own copy of the SALE-A-BRATION brochure, contact me and I'll send one out to you.